Background Increasingly, women of reproductive age participate in recreational running, but its impact on pregnancy outcome is unknown. We investigated whether running affects gestational age at delivery and birth weight as indicators of cervical integrity and placental function, respectively. Methods 1293 female participants were recruited from parkrun, which organises weekly runs involving 1.25 million runners across 450 parks worldwide. Those under 16 or unable to provide outcome data were excluded. Women were categorised according to whether they continued to run during pregnancy or not. Those who continued were further stratified dependent on average weekly kilometres, and which trimester they ran until. Retrospectively collected primary outcomes were gestational age at delivery and birthweight centile. Other outcomes included assisted vaginal delivery rate and prematurity at clinically important gestations. Results There was no significant difference in gestational age at delivery: 279.0 vs 279.6 days (mean difference 0.6 days, CI −1.3 to 2.4 days; P=0.55) or birthweight centile: 46.9%vs 44.9% (mean difference 2.0%, CI −1.3% to −5.3%; P=0.22) in women who stopped running and those who continued, respectively. Assisted vaginal delivery rate was increased in women who ran: 195/714 (27%) vs 128/579 (22%) (OR 1.32; CI 1.02 to 1.71; P=0.03). Conclusion Continuing to run during pregnancy does not appear to affect gestational age or birthweight centile, regardless of mean weekly distance or stage of pregnancy. Assisted vaginal delivery rates were higher in women who ran, possibly due to increased pelvic floor muscle tone. Randomised prospective analysis is necessary to further explore these findings. Recreational running in pregnancy does not appear to affect gestational age at delivery or birthweight centile. Further work is needed to establish the potential link between running and increased likelihood of assisted vaginal delivery. How it might impact on clinical practice in the near future? Previously, evidence specifically related to recreational running during pregnancy has been scarce. Pregnant women can now be reassured that continuing to run, while pregnant, will not affect their baby’s birth weight or increase the likelihood of a preterm delivery. Recreational running is increasing; more than 2 million people per week run on a regular basis in the UK.1 The demographic of runners has also changed; 60% of half marathon participants are women.2 Many of these women are of reproductive age and will consult their obstetrician about the advisability of running during pregnancy. Guidelines recommend 30 minutes of moderate daily exercise for most pregnant women based on the evidence in the current literature that exercise can reduce gestational weight gain (GWG).3–5 Limiting GWG can potentially minimise the risk of gestational diabetes,6 hypertension, pre-eclampsia7 and postpartum weight retention.8 It also may benefit the fetus because GWG is strongly associated with large for gestational age (LGA) infants.9 In the longer term, according to a recent family follow-up study, GWG is positively associated with adult offspring adiposity and cardiometabolic risk factors10 11 and therefore effective GWG management through exercise may have a significant benefit on child growth and chronic disease risk. There are theoretical concerns that excessive exercise during pregnancy can lead to low birth weight, which may increase the risk of future central obesity and cardiovascular morbidity.12 Other potentially harmful effects of exercise in pregnancy are diminished blood flow to the uterus,13 exercise generated heat stress leading to fetal congenital abnormalities,14 15 preterm delivery, and abnormal maternal and fetal heart rates.16 However, it is generally accepted that exercise of moderate intensity is likely to be safe during uncomplicated pregnancy and should be encouraged.17 There is a lack of sound evidence specifically focused on running, a high impact activity which involves both feet being off the ground simultaneously. Considerable forces, generated as the foot strikes the ground, are transmitted through the limbs and pelvic girdle, with potential contre coup effects within the uterus affecting the integrity of the cervix. Given the rapidly increasing number of women running competitively, or just to keep fit, and keen to continue during pregnancy, this is a highly relevant area of research. One study concluded that running at intensity above 90% of maximal heart rate could potentially compromise fetal well-being.16 But these findings were based on a small cohort of 6 elite athletes and therefore not necessarily relevant to the current population of pregnant female runners who participate in a wide range of running activities at different standards and intensities. It is therefore important to establish whether or not, and at what intensity, running puts the fetus at risk. This study, the largest of its kind to date, will focus on a group of women who signed up to the running group ‘parkrun’ who had become pregnant while running regularly, and aims to investigate the effects of running on gestational age at delivery, birthweight centile, assisted vaginal delivery rate, prematurity at various clinically important gestations and proportion of babies below the 3rd, 5th, 10th or above the 90th centile. Participants were recruited from parkrun (parkrun.org), an organisation with over 1.25 million registrants, which organises free weekly timed runs in 450 parks around the world. Information about running habits and birth outcomes of first pregnancy (>24 weeks’ gestation) was collected via an internet-based questionnaire, between 4 November 2014 and 9 January 2015, from women who had previously been pregnant. Previous running history was not collected as the effect on future pregnancies independent of exercise in pregnancy was felt to be less important. SurveyMonkey was used to generate a survey that was piloted on a group of 20 runners, to ensure readability and acceptability and compliance. Minor changes were made prior to uploading on SurveyMonkey. We have attached this survey as online supplementary appendix 1. Those who had not provided birth weight, gestational age data or who had iatrogenic preterm delivery were excluded. The Health Research Authority decision-making tool advised that National Health Service (NHS) Research Ethics committee approval was not needed. Guy’s and St Thomas’ NHS Foundation Trust Research and Development Department confirmed that trust approval was not required for this work. Consent was implicit in participants’ reading of explanatory notes, completing and submitting their online survey responses. No participant information is identifiable in the publication. Women were initially categorised according to whether they continued to run when they realised they were pregnant or if they stopped (primary analysis). They were then further divided according to which trimester of pregnancy they stopped running (first trimester, second trimester, third trimester or never ran in pregnancy, which acted as a control group) and mean weekly kilometre run during pregnancy (never, 1–5 km, 6–12 km and >12 km) (secondary analysis). Powered for outcomes were birth weight and gestational age at delivery. Customised birthweight centiles were calculated adjusting for maternal height, weight, ethnicity and parity, and for neonatal gender and gestational age at delivery.18 Babies below the 3rd centile were regarded as small for gestational age and those above the 90th centile as LGA. Additional outcomes included assisted vaginal delivery rates, prematurity at different clinically important gestations (<30, <34, <37) and proportion of babies below the 3rd, 5th, 10th or above the 90th centile. Statistical analysis was performed using Stata V11.2 software. The effect on neonatal outcomes of mean weekly distance and running into each trimester was investigated using linear and logistic regression for mean age at delivery and birthweight centile. SEs were adjusted for possible non-normal distributions using robust SEs, and results are presented as mean differences. Logistic regression was used to compare binary outcomes such as mode of delivery, and comparisons are presented as ORs. Simple unadjusted comparisons are presented. CIs for binary outcomes were calculated by the exact method. Fifteen thousand five hundred parkrunners responded to the survey and 1293 full responses were completed for gestational age at birth and birthweight data, after five exclusions for iatrogenic preterm deliveries. Recruitment stopped when we had a predefined power in each subgroup: 579/1293 (45%) did not run in pregnancy, 188/1293 (15%) stopped during their first trimester (including women who stopped running when they found they were pregnant), 318/1293 (25%) in their second trimester and 208/1293 (16%) ran into their third trimester. Participant demographics are shown in table 1. Women who never ran in pregnancy were 2.3 kg heavier than those who continued to run. More women who never ran in pregnancy were either overweight (BMI 24–29.9 kg/m2), or obese (BMJ >30), compared to those who continued to run in pregnancy (OR 0.34, 95% CI 0.18 to 0.67 and OR 0.26, 95% CI 0.11 to 0.61, respectively; P<0.001). There was no significant difference in gestational age at delivery (where 280 days is 40 weeks of gestation): 279.0 vs 279.6 days (mean difference 0.6 days, CI −1.3 to 2.4 days; P=0.55) or birthweight centile: 46.9%vs 44.9% (mean difference 2.0%, CI −1.3% to −5.3%; P=0.22) in women who stopped running and those who continued, respectively. Mean weekly running distance and trimester women stopped running did not appear to effect either outcome as demonstrated by tables 2 and 3, which show no particular trend towards earlier delivery or lower birthweight centile, respectively, even in those women who continued to run the greatest mean weekly distance into the third trimester. Assisted vaginal delivery rate significantly increased in women who ran in pregnancy compared with those who stopped; 195/714 (27%) vs 128/579 (22%) (OR 1.32; CI 1.02 to 1.71; P=0.03) (figure 1), but there was no significant difference dependent on mean weekly running distance or trimester that women stopped running. Assisted vaginal delivery rate in women who never ran during pregnancy compared with those who continued to run. Preterm birth rate across all gestations of interest was similar regardless of whether women ran in pregnancy or not: 5.9% (42/714) vs 7.6% (44/579); P=0.22, and in those who ran, there was no effect dependent on mean weekly running distance or trimester women ran into. Furthermore, there was no difference in proportion of babies below the 3rd, 5th, 10th or above the 90th centile. There was no significant difference in gestational age at delivery or birthweight centile between women who stopped running and those who continued during pregnancy, regardless of distance, or stage of pregnancy, suggesting that recreational running per se has little influence on placental function or on mechanisms of labour onset. Pressure or impact effects of the fetal head on cervical integrity while running appear not to influence gestation of labour onset. 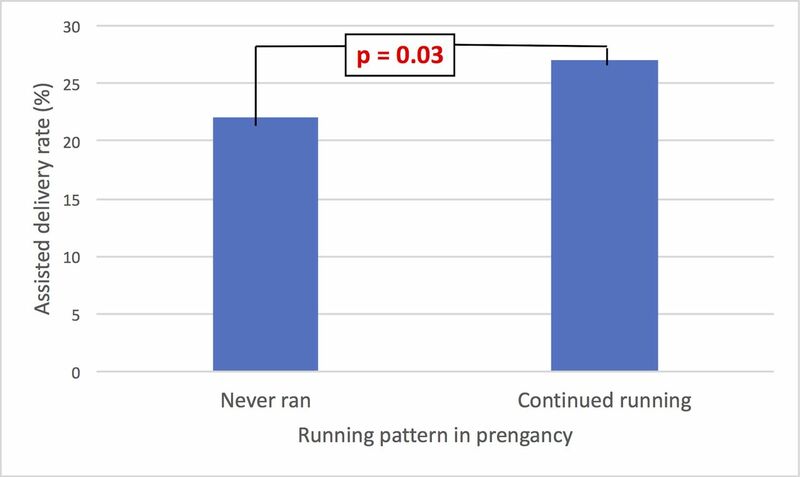 Continuing running when pregnant appears to increase the risk of assisted vaginal delivery, compared with women who stopped. Overall, the rates of assisted vaginal delivery were high (25%) although women were reporting their first pregnancy, and assisted vaginal delivery rates are generally thought to be higher in primiparous women. There is a plausible mechanism for an increase in assistance in runners, where exercised pelvic floor muscles may provide a soft tissue resistance to crowning of the fetal head that results in delay in second stage and an increased requirement for assisted vaginal delivery. Women who stopped running during pregnancy reported significantly higher BMIs. Although an interesting observation, this is not sufficient to suggest a clear association between running during pregnancy and lower maternal weight or reduced weight gain, first because women who continued to run during pregnancy are likely to be more committed runners with a lower BMI to start with, rather than due to the running they did while pregnant. Second, women recorded their current BMI, rather than BMI during their pregnancy, although, for the purposes of this study, current BMI is probably a reasonable proxy for BMI at the beginning of participants’ pregnancies in this group of motivated, health conscious parkrun runners, where BMI is likely to have remained relatively stable. We used customised birthweight centiles18 adjusted for maternal height, weight, parity and ethnic group, in order to avoid the effects of these confounding factors. Previous studies have not used this method making it difficult to attribute their findings solely to the effects of exercise. Running habits were established by asking women to report which trimester of pregnancy they stopped running and how many kilometres they ran on average per week. This method was susceptible to recall bias, but there is no general consensus in the literature about the most reliable way to collect this type of data.20 To avoid further recall bias, current BMI—as opposed to BMI at the time of the reported pregnancy—was recorded and this is likely to be similar to their prepregnant BMI in a running population. The survey deliberately gathered memorable categorical data to avoid the problems associated with inaccurate recall. It is well established that recall of gestational age and prior birth weight is highly accurate, and the other categorical data that we analysed, such as need for assisted delivery, are likely to be equally unforgettable.21 22 We excluded any women who could not recall this data, further increasing its accuracy. By comparing across gestational age time frames, we controlled for methodological bias. In this study, we have focused solely on running, which is one of its strengths. We did not enquire about other exercise undertaken while pregnant, nor taken up if they did not run. However, our hypothesis concerns the effects of recreational running which clearly showed no effect on birth weight and time of delivery including with intensity regardless of other exercise. Other exercise undertaken by the women in addition to running could have contributed to the effects on assisted vaginal deliveries independent of running, for example, influencing pelvic floor tone making running an associative rather than causative factor. To date, few papers have discussed the impact of a specific type of exercise on pregnancy, such as running. The need for focused research is well recognised given theoretical mechanisms of potential harm being related to impact and intensity.13–16 It is appropriate to identify running as more intensive than other types of exercise, with considerable forces, generated as the foot hits the ground, potentially affecting the fetus and the cervix. Recent American College of Obstetricians and Gynecologists guidelines suggest ‘30 min or more of moderate exercise a day on most, if not all, days of the week’.17 The few existing studies focusing on running in pregnancy have investigated small groups of experienced athletes limiting their power to detect important effects in the increasingly diverse group of women running during pregnancy.16 23 Participants in our study were more representative of the range of abilities of women in the general running population—their 5 km times ranged from 15 to 50 min (parkrun.org.uk)—and as a result, the findings are generalisable.
. The 10 types of runner. BBC News. http://www.bbc.co.uk/news/magazine-25263401 (accessed 30 Sep 2016). American College of Sports Medicine. ACSM’s guidelines for exercise testing and prescription. 6th edn. Philadelphia: Lippincott and Wilkins, 2000.
. Maternal hyperthermia and the risk for neural tube defects in offspring: systematic review and meta-analysis. Epidemiology 2005;16:216–9. Salvesen KÅ1, Hem E, Sundgot-Borgen J. Fetal wellbeing may be compromised during strenuous exercise among pregnant elite athletes. Br J Sports Med 2012;46:279–83. The American College of Obstetricians and Gynecologists. Committee Opinion. Physical Activity and Exercise During Pregnancy and the Postpartum Period. December 2015, Number 650. http://www.acog.org/Resources-And-Publications/Committee-Opinions/Committee-on-Obstetric-Practice/Physical-Activity-and-Exercise. (accessed 5 Oct 2016). The SCOPE Study. Creating a pregnancy biobank for international research to develop novel tests to predict late pregnancy diseases. http://www.scopestudy.net. (accessed on 11 Dec 2016). Contributors KK analysed the results and wrote the paper. MH designed the survey, distributed it among study participants and reviewed the draft paper. NLH was involved in the initiation of the idea for the study, analysis of results and writing of the paper. PTS designed and conducted statistical analysis and revised the draft paper. AHS devised the idea for the study and coordinated planning, analysis, reporting of results and was involved in writing the paper. He is guarantor. Ethics approval The Health Research Authority decision making tool advised that NHS Research Ethics committee approval was not needed. Guy’s and St Thomas’ NHS Foundation Trust Research and Development Department confirmed that trust approval was not required for this work. Data sharing statement All authors had full access to all of the data (including statistical reports and tables) in the study and can take responsibility for the integrity of the data and the accuracy of the data analysis.